Yes, yes, I know it’s been a while. But I promise I have been busy working away. 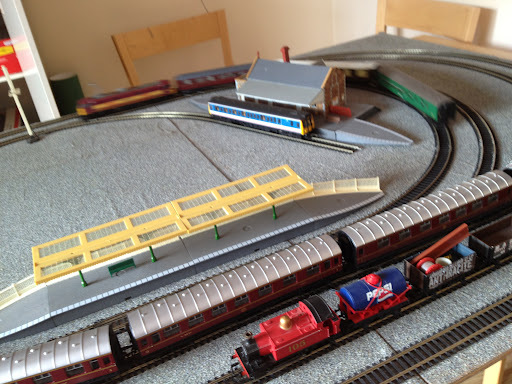 Both with real life things and actual important things like Model Railwaying! 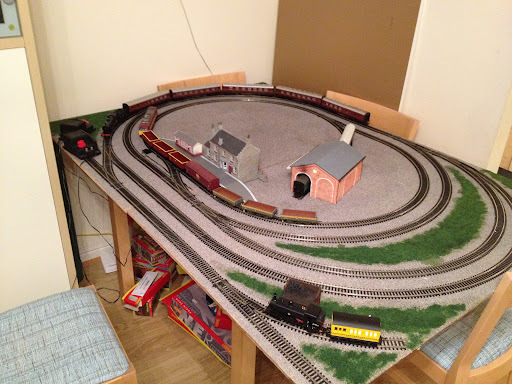 In the beginning there was ballast-coloured-scenic-mat and it was good. But now it’s time to start thinking about improving on ‘good’ and developing the scenery. Or in other words to start adding the Green. 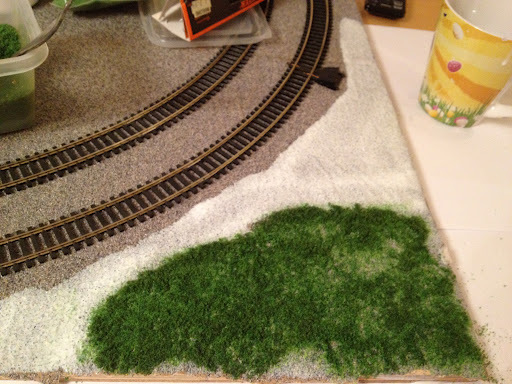 If you head back to ‘Planning Permission’ (Episode 3) you can refresh yourself on the scenic materials we have on offer to us and how I originally arrived at the decision to first lay a ballast coloured matt and then secondly add some grass/field based green scatted. It’s now time for that second step. Scenic scatter comes in a huge variety of colours, textures, sizes and coarsenesses. If you’re feeling particularly dramatic you’ll find colours such as red/orange/brown for quarry, industrial and maybe even autumnal effects. You’ll also find a variety of rocks, gravel and mineral effects in the Scenic Scatter Isle of your model shop/ebay. But we’re going to start simple with some green for a field/grass effect. Again there’ll be a large choice on which ‘Green’ you choose. I went for a light-green bag and a dark-green bag which I shall mix together. I’m hoping this will create a more natural look, rather just using one shade of green. Scenic scatter is rather hard to describe. It looks like powder paint, but feels a little more ‘fuzzy’ than that. On returning home I mixed the two colours 50/50 in a container. That isn’t the best picture in the world above, but if you look carefully – just in the top right of the picture – you’ll see the bag of light green scatter which has been mixed together with the dark green on the left. I started with a rather in-offensive test patch area to the corner of one of the boards. As before I mixed PVA glue with a bit of water (I’m not quite sure of the ratio I used here probably about 70/30, you want the glue to spread easily but not to be runny like water) and painted this on liberally to the board. Remember PVA glue dries clear so it doesn’t matter if you get it on an area you didn’t mean to, but do try to avoid the track. Obviously. 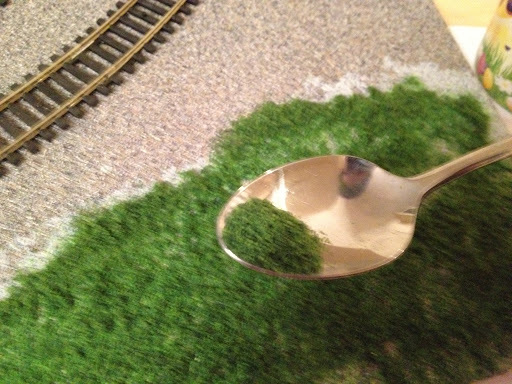 Next sprinkle on your scatter. I don’t think there’s a right or wrong way to go about this but I used a spoon. This way you can dump large amounts of scatter; as well as being able to tap the spoon with your finger to scatter more finely on the edges of the glue. Eventually we will add a second coat of glue on top of the scatter we have just laid – however I found it useful to pat down the scatter using either my hand, the back of the spoon, or even more effective – a folded up piece of paper. Don’t be too forceful or you’ll end up getting the scatter stuck to the paper, just lightly press down and this helps the scatter to stick to the board as well as helping it to spread evenly. 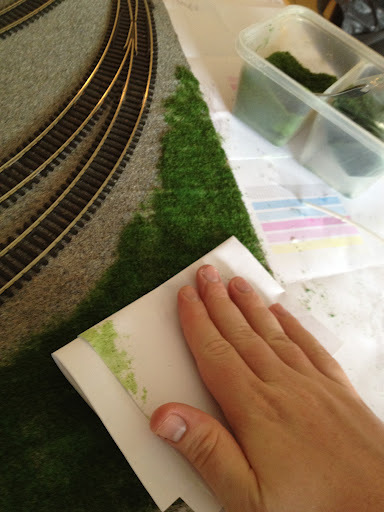 I let the test section dry over night and once I was happy that nothing had gone terribly wrong I went ahead and continued to add green elsewhere on the layout. It might be worth having a small piece of wood with a section of track nailed down to for these testing purposes. However I don’t have such piece of small wood so this is why I just used a small section of the layout for my scenic test. After repeating the process on a larger scale this is what one of the boards looked like. You’ll notice the creases in the scenic mat are more obvious here. I think this had something to do with the glue still being quite wet, this eventually evened itself out after the second layer of glue and more paper-patting. So here’s a picture of the end game after the 2nd layer has dried and I’m rather pleased with the result! The dual colour has really worked a treat and the 2nd layer of glue gives the scatter a nice finish. 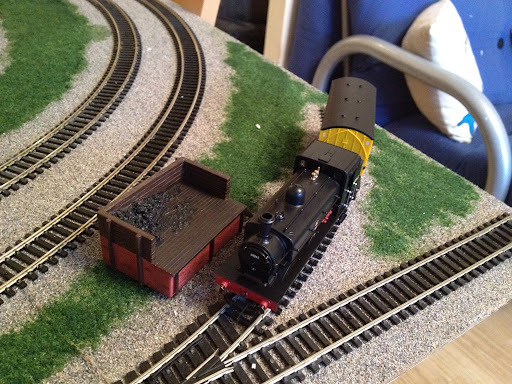 The little coal dump by the way is from the Hornby Skaledale range – I will get onto buildings and ornaments on a later episode. There was however a slight problem. 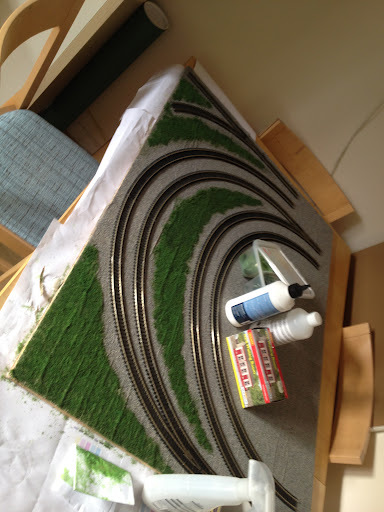 You’ll notice top left of the picture there’s an unsightly patch of green that’s not following the line of the track? This isn’t a rogue patch of scatter – this is where the glue has run. When you paint on the 2nd layer of glue it is almost unavoidable that your brushes contact with the scatter doesn’t eventually dye the rest of the glue a pale green colour. This rather unfortunately is the result of that green died glue running! You can see it more evidently on this picture occurring in multiple locations! This does look really sloppy but thankfully I’ve come up with an idea to solve it. You remember I said scatter comes in various different forms and colours? 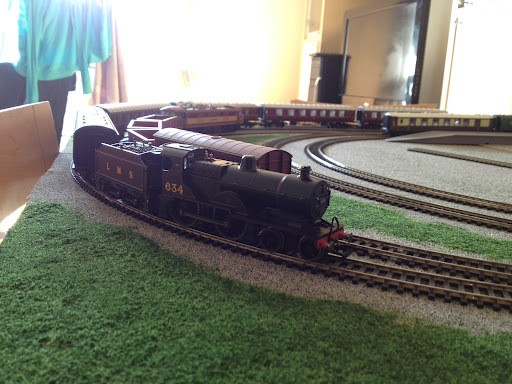 Well thankfully they also make a scatter version of the grey ballast. 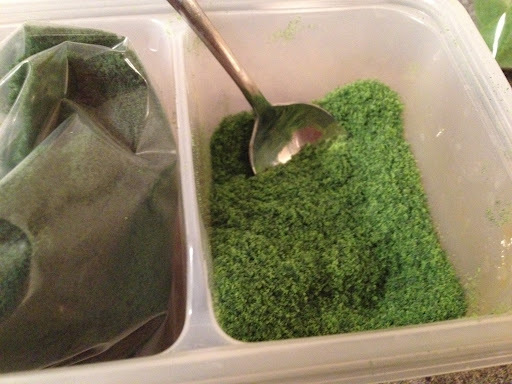 I’m hoping that adding some of this to the offending areas and – here’s the clever part – dropping on some glue using a pipette so that I’m not risking the glue being discoloured by the scatter will solve the problem! This really does highlight the importance of being controlled with your 2nd layer of glue! I’d even recommend not gluing right to the edge and instead waiting for this to dry before pipett-ing the boundary between grey and green. You’ll also note that there is still a large area in the middle of the board that’s still grey. As I add buildings so will I work out where more scatter needs be applied. We’ll talk about buildings another time. 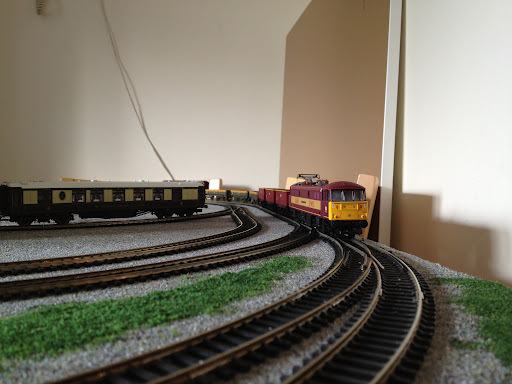 Until then here’s a few more close ups of trains and good looking green!